Every marketer knows that measuring the effectiveness of an event marketing campaign can get complicated. With marketing automation for events, you can save yourself (and your whole marketing team) time, energy, and money. From sending invites or distributing tickets, to following up with the appropriate surveys and thank you messages, using a marketing platform with email automation is a lifesaver. Whether you’re trying to drive marketing interactions before, during, or after a seminar, webinar, trade show, conference, or some other kind of live or digital event, keep in mind these 5 best practices. .
1) Grow Your Audience – Create targeted email blasts based on event location and audience. When you are attracting an audience for an event, location is a great way to start finding members of your target audience who are most likely to attend your event. In the weeks and months leading up to the event, you should notify the residents of the hosting town/city that you’ll be in their area. Then, you’ll want to figure out the subset of people who fall under your target demographic and entice them to come to the event using a more personal tone. For example, let’s say your target audience is young women ages 18-30 and the conference is taking place in a college town/city. You could reach out to the university to see if there’s a way for you to obtain emails of female students who may be interested. Or, maybe there is a way for you to table on campus and collect emails in exchange for free promotional swag. You want to narrow down your list of potential attendees, send an initial email blast, and then form an email drip campaign to engage your targets. 2) Engage Your Audience – During the event, set up an easy lead capture process with autoresponder emails. Whether your event is physical or virtual, there is always some kind of check-in system that verifies attendance. Naturally, this attendee check-in serves as the ultimate data collection opportunity as well. Using marketing automation, you can set up autoresponder emails that will be sent immediately after your attendee hits “submit”. This automated email is more important than you might think. It serves as the starting point for your drip campaigns. Whether you scan tickets to take attendance or have attendees fill out a quick online form, attendee data should be in your data warehouse before the event is over. 3) Assign Value to Event-Generated Leads – Attach your leads to specific marketing campaigns. Capturing leads is great, but the next step is making sure you can figure out where they came from. The most important piece of information for you is the number of event-generated leads that converted to customers. You need to be able to identify and quantify event-generated leads to perform attribution analysis and calculate ROI. Thankfully, it’s a seamless process to attribute revenue to its source when leads are attached to campaigns within a digital marketing platform. A platform with automation capabilities can help you avoid the hassle of manually organizing your leads to figure out their origins and how many converted. With access to data in a platform, you’re empowered to calculate the ROI of your event presence and to predict future event attendance and budget spend. For example, you can set up an automation system up so that leads collected via landing pages are automatically added to your data warehouse. With a platform like the Chainlink Marketing Platform, you can ensure your data is being properly imported from a spreadsheet and stored in a centralized data warehouse where contacts are easy to manage and access. 4) Boost Future Attendance – Nurture your leads with a post-event drip campaign. Post-event drip campaigns should result in more attendees and overall increased interest in future events. If they aren’t well-executed, drip campaigns are interpreted by recipients as forced and robotic. If they aren’t well-executed, drip campaigns are interpreted by recipients as forced and robotic. To avoid emails that seem mass-produced and fall flat, use the name of a specific sales representative as the sender. That way, instead of “Chainlink Relationship Marketing” appearing as the sender, it says “Gabby from Chainlink”, which already sounds more personal. Strategically drip content to your targets over time. Other examples of content that you could drip over time (along with short blurbs of what the event is and why it’s worth attending) include blog articles, free trials of services, case studies, or e-books. In the same way that you would approach a drip campaign for a product or service, you’ll want to ease your prospect into genuinely wanting to attend the event with useful, engaging content. 5) Create Coordinated Social Efforts – Use social media to your advantage. Your event’s social media campaign needs to have impeccable timing. 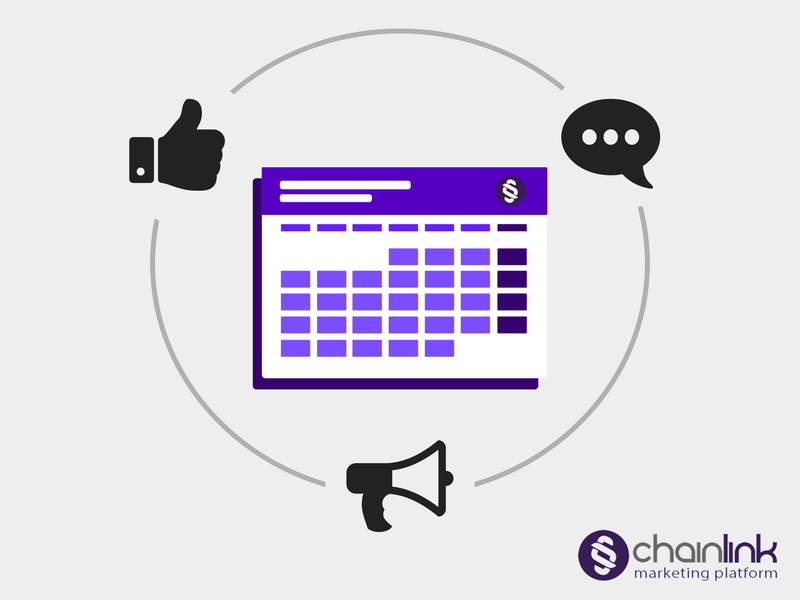 You should start strategizing your social media approach the minute you launch your event’s email marketing campaign (which should include specific registration information and other details). Research and decide which platform(s) make the most sense to use before, during, and after your event. Then during the event, you should be closely monitoring social media activity as much as humanly possible. Respond intelligently to prospects/leads/customers in real time. You can even assign a trustworthy and qualified member of your team to be dedicated to this task. Real-time source of feedback on your live events is more important than you realize. It’s a prime opportunity to engage with people and get immediate, authentic responses. As a marketer, you might even be able to respond during the event to address complaints from your attendees (which isn’t easy, but proves that you’re open-minded and self-aware as a company). You would be amazed at the power of positive interactions and the right usage of hashtags. Check out another one of our posts to refresh your memory on leveraging social media metrics, such as Twitter business analytics. By using an effective digital marketing platform, you can streamline customer communications and data collection while improving your ability to accurately measure and attribute ROI. Implementing best practices and automation can help improve marketing efforts throughout every event. At Chainlink, we want you to be able to easily customize targeted event marketing programs. With our proprietary Chainlink Marketing Platform, you can quickly and easily craft personalized dynamic programs that will automatically update based on your contacts’ interactions and behaviors. While all data will already be collected and aggregated in the Chainlink Data Warehouse, we can push data directly into your CRM of choice through our various APIs. We want it to be effortless for you to generate more pre-registration sign-ups, send personalized automated reminders before the event, and extend interactions via post-event surveys and follow-ups. All of our customer engagement tools have been designed by us to help you generate more leads and grow your business. What are you waiting for? Try a free demo today by signing up below.